Access to the highest calibre and best variety of occupational therapy periodicals is a primary benefit of CAOT membership. CAOT Members rank access to these evidence-based articles as a top member benefit that meets or exceeds their expectations. Full content is locked for members and, in some cases, subscribers. Read the Canadian Journal of Occupational Therapy (CJOT) CAOT’s official peer-reviewed journal with principal content that provides empirical evidence and theoretical/conceptual arguments that support and advance occupational therapy globally. – Abstracts are open to all readers. 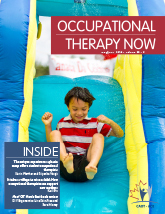 Read Occupational Therapy Now (OT Now) CAOT’s practice magazine providing occupational therapists with information to meet the challenges of their day-to-day practice. Articles encourage discussion and debate of occupational therapy issues and appeal to anyone with an interest in occupation and its impact on health. CAOT members can access online journals including the American Journal of Occupational Therapy (AJOT), Australian Occupational Therapy Journal (AOTJ), British Journal of Occupational Therapy (BJOT), Hong Kong Journal of Occupational Therapy (HKJOT), New Zealand Journal of Occupational Therapy (NZJOT), South African Journal of Occupational Therapy (SAJOT) (limited access), and WFOT Bulletin. There is also an option to receive regular alerts for CJOT and other supported SAGE publications.